A full range of regular morning classes are offered to children ages twelve months through Junior Kindergarten, from 9:00 am – 1:00 pm. Early Drop, Afternoon Enrichment, and Late Pick-Up are available for all age groups five days per week, extending the school day from 8:00 am to 5:00 pm. Peelim (1’s turning 2): toddlers have the opportunity to bring their natural curiosity to life with a structured and facilitated environment that introduces a preschool schedule and facilitates exploration of a new environment and an introduction to play-based learning. 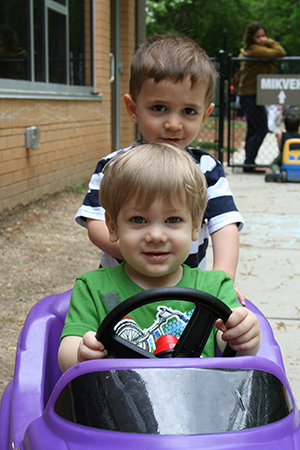 Parparim (2’s turning 3): teachers work with children to foster independence, cooperation and self-esteem. As play evolves, independent and parallel play becomes interactive, giving great learning opportunities for social-emotional development. Dageem (3’s turning 4): as children’s verbal and social abilities develop they are able to engage in more complex and imaginative play. Teachers gain direction from children as to the themes and concepts they are intrigued by, and spend time co-exploring the natural world. Ariyot (4’s & 5’s turning 5 & 6): children explore and create in a myriad of subjects, with guidance from teachers to maintain their enthusiasm for learning and ensure kindergarten readiness. Enrichment Programs: The morning programs are supplemented with teachers and volunteers who bring unique skills and expertise into the regular preschool day.